Cicero's De Oratore is one of the masterpieces of Latin prose. A literary dialogue in the Greek tradition, it was written in 55 BCE in the midst of political turmoil at Rome, but reports a discussion 'concerning the (ideal) orator' that supposedly took place in 90 BCE, just before an earlier crisis. Cicero features eminent orators and statesmen of the past as participants in this discussion, presenting competing views on many topics. This edition of Book III is the first since 1893 to provide a Latin text and full introduction and commentary in English. 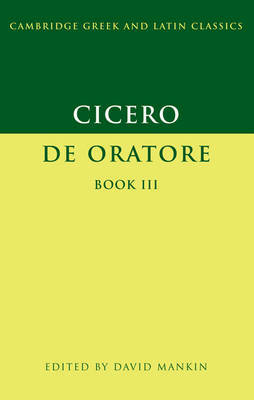 It is intended to help advanced students and others interested in Roman literature to comprehend the grammar and appreciate the stylistic nuances of Cicero's Latin, to trace the historical, literary, and theoretical background of the topics addressed, and to interpret Book III in relation to the rest of De Oratore and to Cicero's other works.